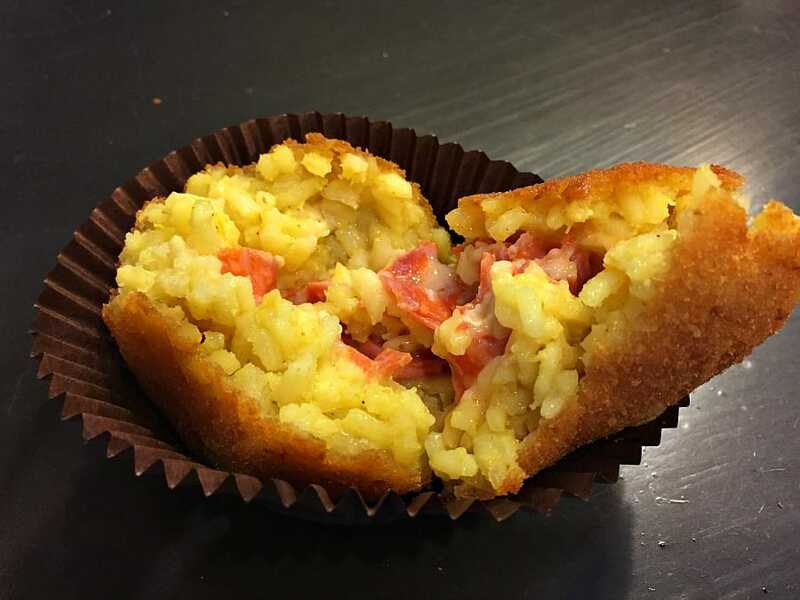 I love the name of this Palermo Street Food Tour – StrEat Palermo. As the name implies, today we were doing one of our favorite things, sampling street food. Eating street food gets you right into the center of the culture of a new place and a glimpse at the heart of the people who are sustained by it. 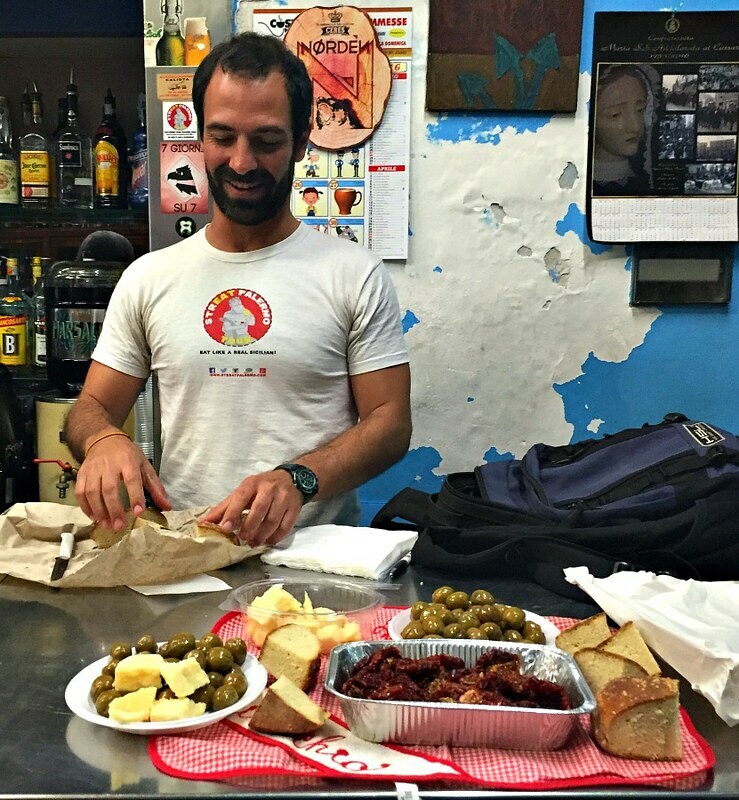 But this tour had much more to offer than just showcasing the street food in Palermo. Sicily in an Italian island that has a long list of conquerors, and this has had a huge impact on its culture, and it’s food. If you are thinking this consists of pizza and meatballs, guess again. 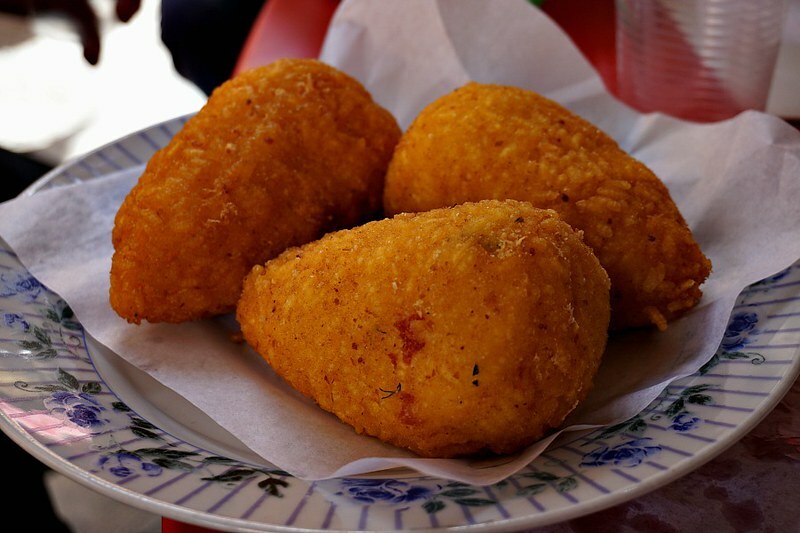 Eating like a local on a Palermo street food tour will definitely expand your previous range of standard food choices. Here, nothing goes to waste. And like many of the generations of who have lived here, their traditions, including the food offered on the street, have been embraced for centuries. We joined up with owner and tour operator, Marco, who grew up in Palermo. 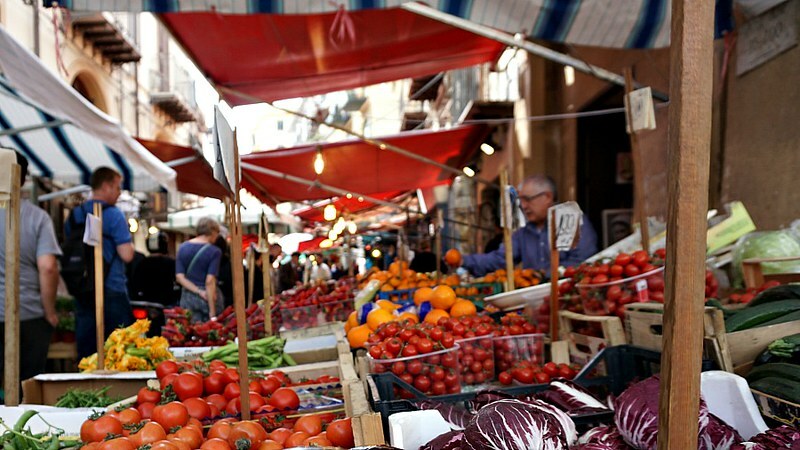 Sicilians, we soon learned, are passionate about their food. 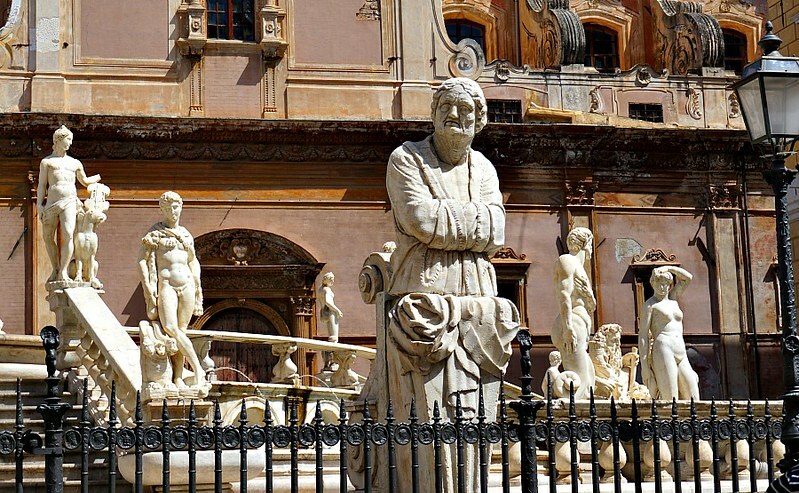 And while they do acknowledge their Italian brethren and Sicilian heritage, the citizens of Palermo have a unique past that is all their own. That said, anywhere you go in Italy, you will hear that the region in which you find your feet has the best of everything. If you live in Rome, of course your prefer (and possibly scoff) at the mild olive oil from Milan in comparison to the robust version you enjoy. Today we were ready to put Palermo’s claim as having some of the very best street food in the world to the test. Our first taste of the day set the tone for the rest. We stopped at an unassuming cart with a basket covered with a dish towel. Across from us a fruit vendor sang out the specials of the day and got into loud discussions with the vendor selling fresh vegetables next door. Marco beckoned us in closer, telling us that within the basket was a special gift. 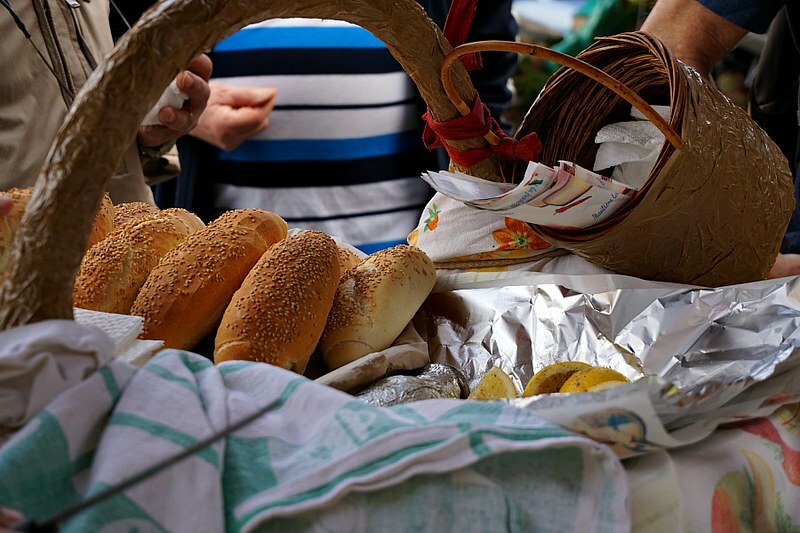 Several locals were milling about, getting their samples of the gift tucked into fresh-baked rolls covered in sesame seeds. To be honest, when the vendor slid his hand into the warm basket and deposited a sample on a scrap of wax paper with a squeeze of lemon, I wasn’t so sure how thankful I was for the steamy bits before me. The warm bits were glutenous, lightly spiced and lemony. Actually, it was surprisingly good. The offering, known as frittula, are the leftover bits from processing of cows. Frittula is considered a delicacy by locals that is only available in the morning until the baskets contents have run dry. It didn’t take long to discover that analogy of taking your lemons and making lemonade is something the citizenry of Palermo have down to a science. Throughout the walk, we saw statures and images of the patron saints and symbols of the city. One of symbol s, the Genius of Palermo, embodies the theme of perseverance under duress. 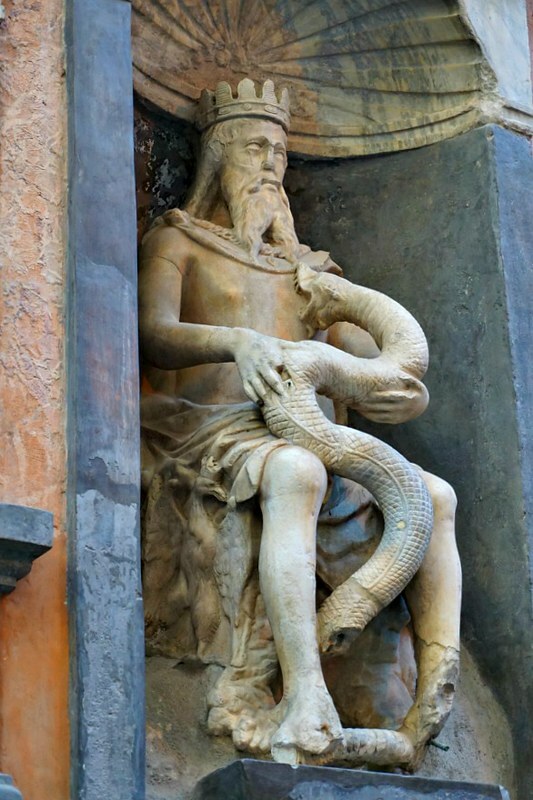 It depicts an elderly wise man or monarch with a young body and a serpent scrolled around his arm, biting his chest. 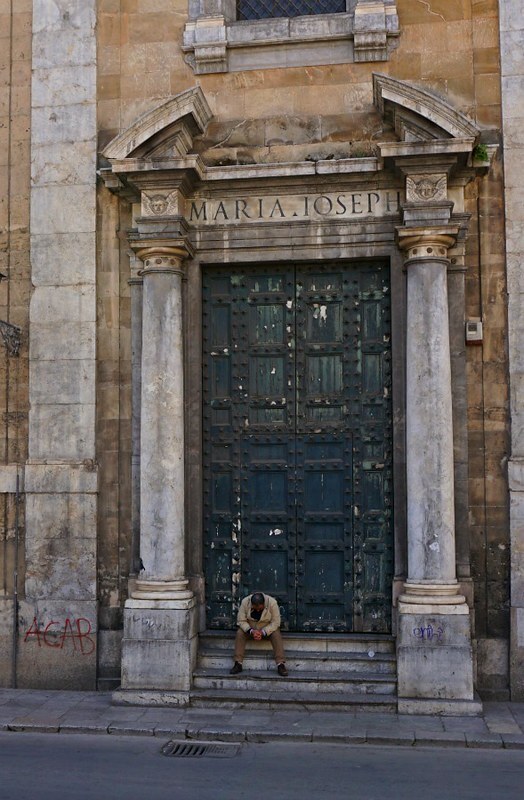 Like with many things in Palermo, the true meaning of the symbol is unknown. And therefore its meaning is left to legend and interpretation, of which there are many. One that seemed to fit is that the heart of Palermo is strong and has survived despite being repeatedly over run by foreign invaders. The wisdom gained from having a culture impacted by adversity and enhanced by the foreign cuisine and traditions has been met at a price. In the end, the symbol seems suggest the use of persistence and prudence in all things. I wondered how all of this history, perseverance and value of maintaining a sense of identity would play out in the food. As we found, These resilient Sicilians are able to take a bit of grit and somehow turn it into something worth lining up to try. In the market, We meandered up the narrow street, flanked on either side by vendors of all sorts. Fruit, fish, spices, olives, bread, wine were all available in abundance. Marco explained that here you need to be very loyal to your vendors. Using the fish vendor as an example – he will know your preferences and will call you to let you know when your favorite seafood has become available. No time to shop? If you tell him what you want for dinner, he will shop for all of the ingredients and have them packaged and ready for you on your way home. But cross your vendor by going to a different fish monger, and its nothings but left over dried out parts for you. Maybe that stereotypical Sicilian temper does have some merit after all? So that brings up the inevitable subject of the mafia. According to Marco’s account there remains a mob presence in Sicily, but the extortion practices are largely now absent in small mom and pop stores. Many shop owners have banded together, refusing to pay and insisting any effort to extort will be met with insistence of police action. Mobsters by and large have tired of trying to shake down the small guys, and now pretty much leave them alone. It was soon time for another food stop, and in this case a sampling of some Palermo’s popular fried foods. 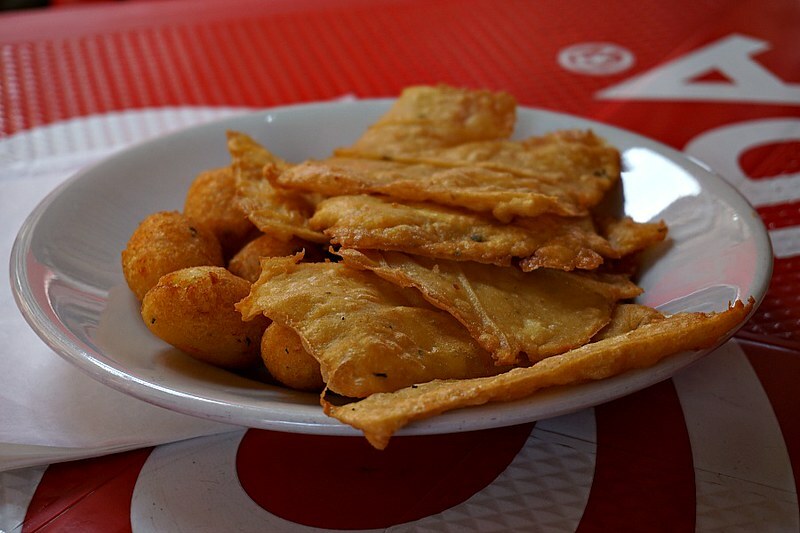 Here a hot appetizer platter typically includes fried potato croquettes (cazzilli), chickpea fritters (panelle) and other vegetables, sometimes covered in batter made with chickpeas seasoned with mint. 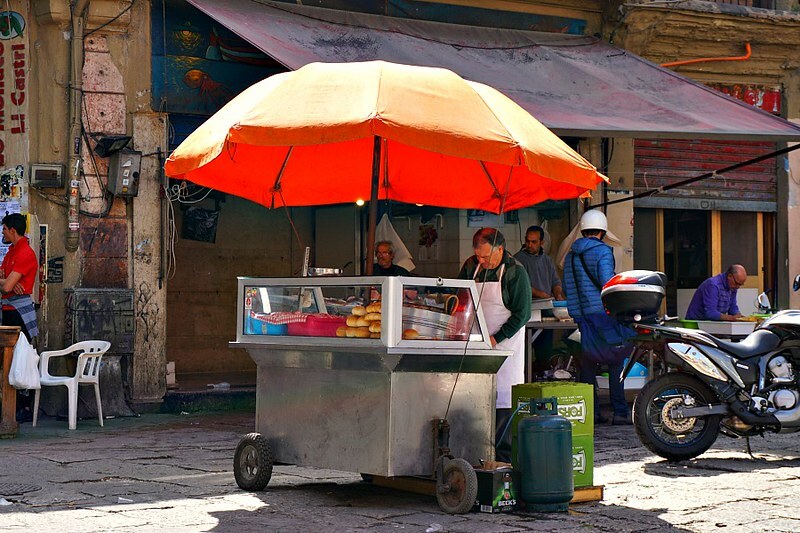 These food traditional Sicilian street foods are left over from Arabs who made a lasting mark on the cuisine and culture here. We also tried some fried cauliflower (called broccoli here ) and my favorite taste of the day – arancine. These delightful rice balls are deep-fried and crunchy on the outside. Inside the fluffy glutenous rice has a savory center, the most typical here being ham and cheese. They were as delicious as they were filling, and we were just getting started. 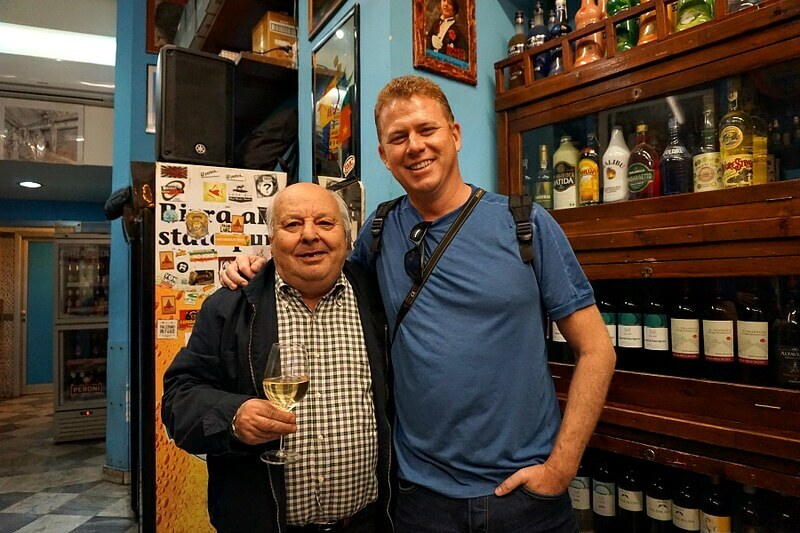 As we wandered along Marco shared stories about the history of Palermo and the legends and superstitions that were passed down through the generations. People jovially greeted Marco as we made our way along the street, picking up little treats from various shops as we traversed the market. We made our way to a place where Marco started preparing a picnic – one of the most unusual picnics I have attended. On this stop we entered a small bar where regulars were leaning against the bar. We were very warmly greeted (maybe too warmly?) and I was soon to find out why. We snacked on delicacies that Marco selected along the way along with some local wine. 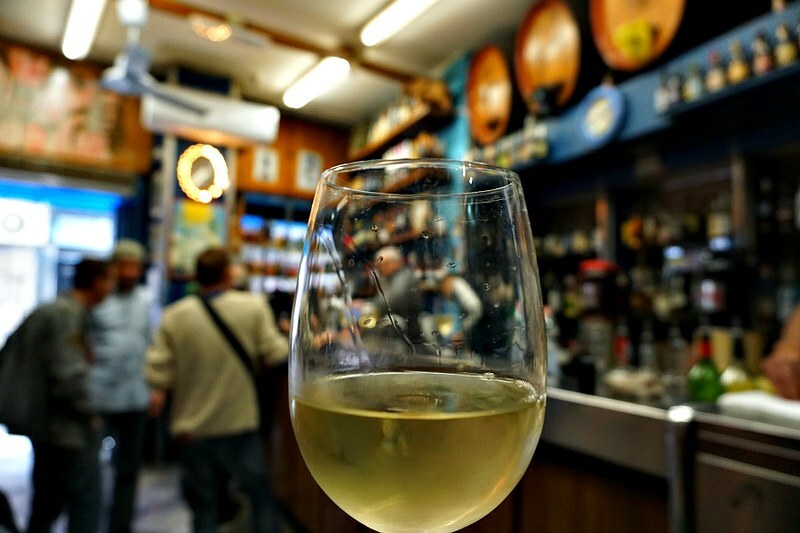 We found the wine in Sicily to be relatively inexpensive and quite good for the price (one potential reason for the good mood of the clientele). Marco confided while we sipped our wine that he has been coming to this bar for years and spent a good amount of his college days as a regular here. As we left to continue our sampling the locals descended on our leftovers like a pack of wild dogs – toasting us happily as we went on our way. Marco indicated that the regulars had been concerned that we would finish all of the food before we left and were relieved that there was plenty left for them to descend upon. Marco used the word “piranhas” I believe. No wonder they were so happy to see us. Cheers to the piranhas of Palermo! 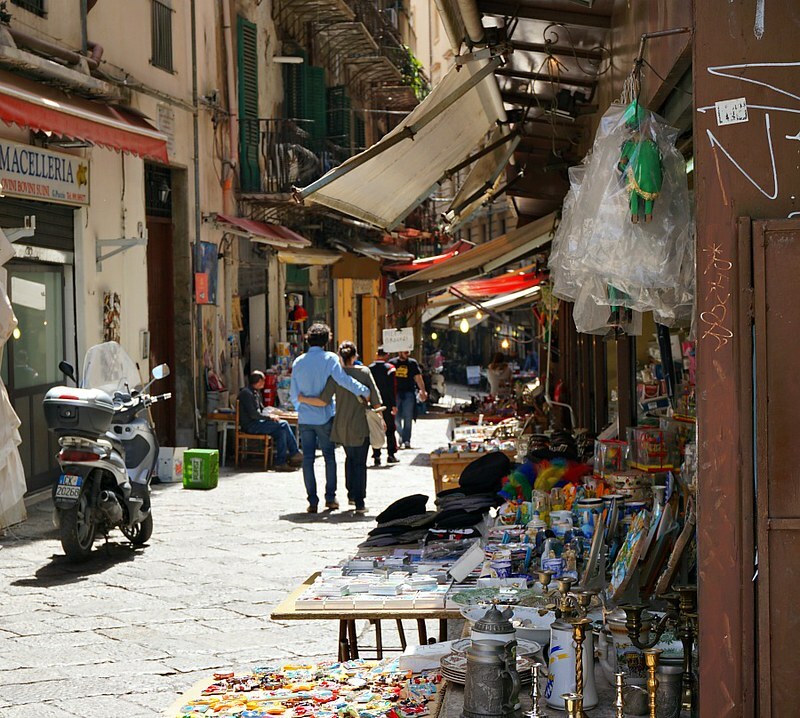 We continued our wandering along with locals shopping in the market, stopping now and again to hear stories about Palermo’s past and present. All the while trying to make room for yet another taste – and there were several more to come. Along with a surprise. Our next bite was more familiar – but whatever you do, don’t call it pizza. Sfincione is a thick bread dough topped with tomato, cheese and bread crumbs. 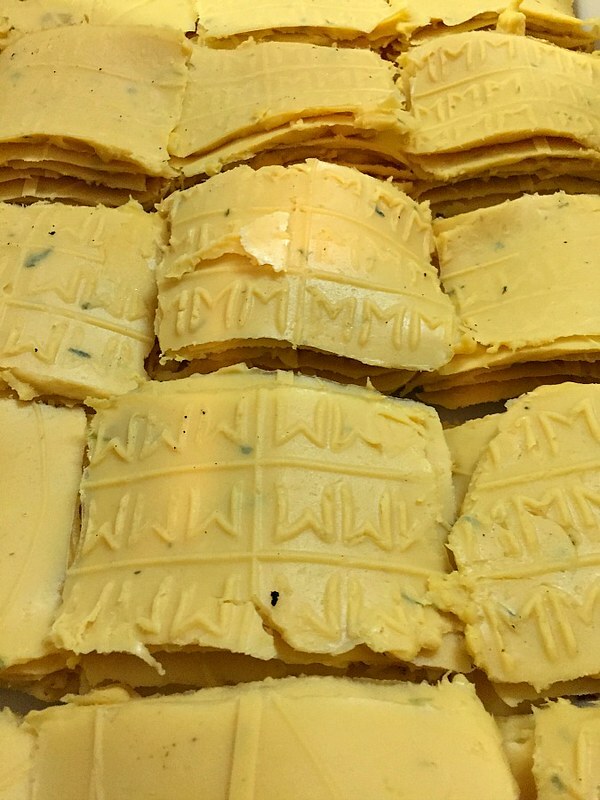 This popular street food is made by one bakery in town, and sold in carts in the center of town. 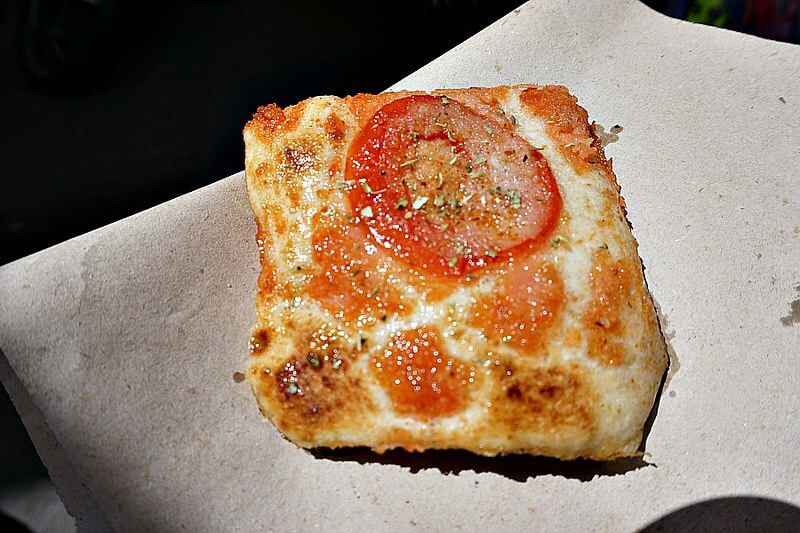 Sfincione has a spongy texture, more like focaccia. 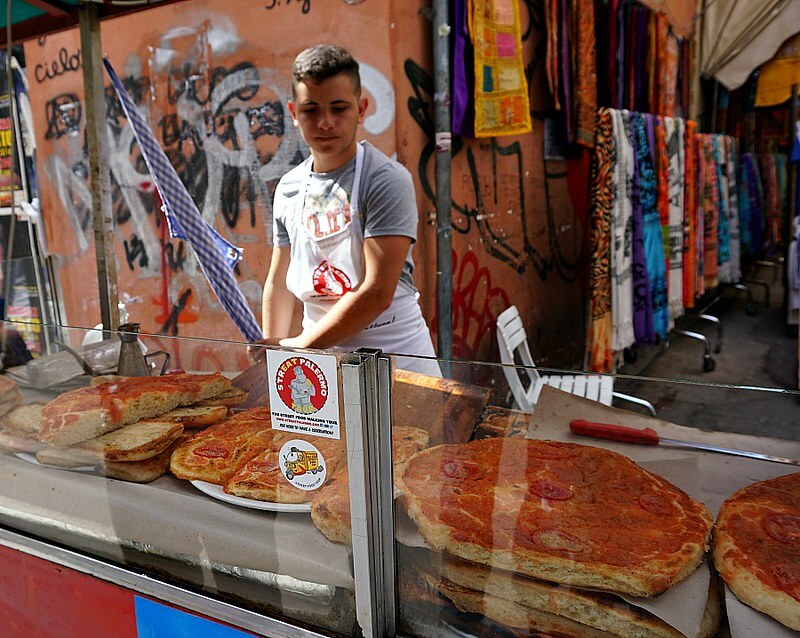 Vendors invite you to try the bread, “full of oil and a little dust.” The dust referring to the sprinkled cheese/breadcrumb mixture on top and paying homage to the dusty streets on which it is enjoyed. At this point, as you can imagine, we were getting pretty full. We walked for a while longer, taking in the sights and trying to work up an appetite for what Marco had in store for us next. Which, admittedly, took a little bit of a sell job. This gentlemen and his brother have been taking turns every other day cooking up this Palermo Street Food delicacy. 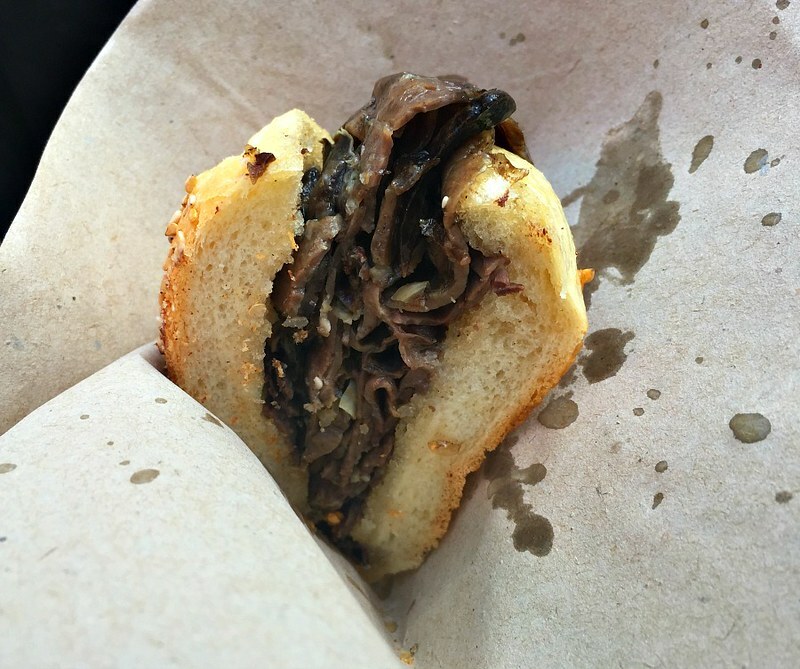 The spleen sandwich (Pane ca’ Meusa). A few on the tour were a little reluctant to try it. Marco described it as pieces of spleen and lung cooked up in what I suspect was lard. The vendor seemed to take a little offense when some were refusing his offering, exclaiming in Italian “How do you know you don’t like it unless you try.” We had actually had a spleen sandwich on a street food tour in Marrakech, but more of a ground version. And we thought this version was equally good, much to the delight of the vendor. We had one more food stop on our tour, and I’ll bet you can guess what it was? After much personal testing of the local offerings, Marco insisted that we were about to have the BEST cannoli in Palermo. 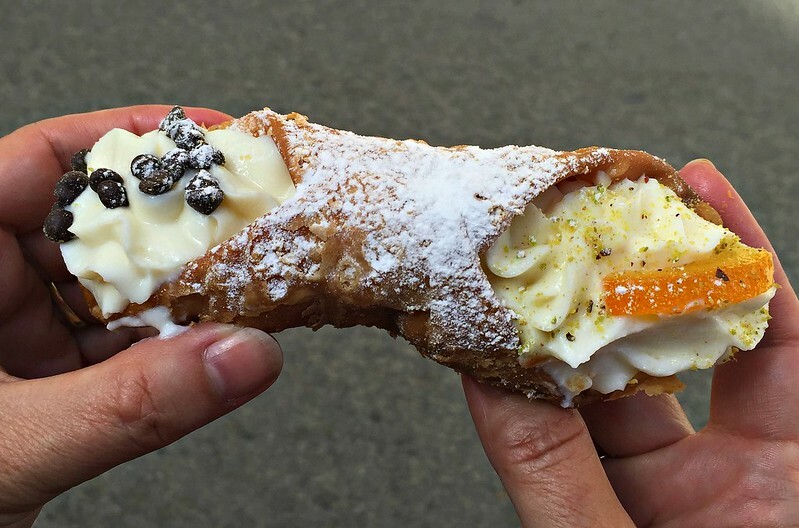 Even though this was our first cannoli in Sicily, we can say that despite being pretty full, we finished every crumb of ours. It was that good. And now onto our last stop. We ended the tour at the Cathedral of Palermo. This historic building was both visually stunning on the inside and out. Inside the cathedral was equally beautiful. As Marco gave us a overview of the cathedral’s rich past, he paused in front of this ornate vestibule. 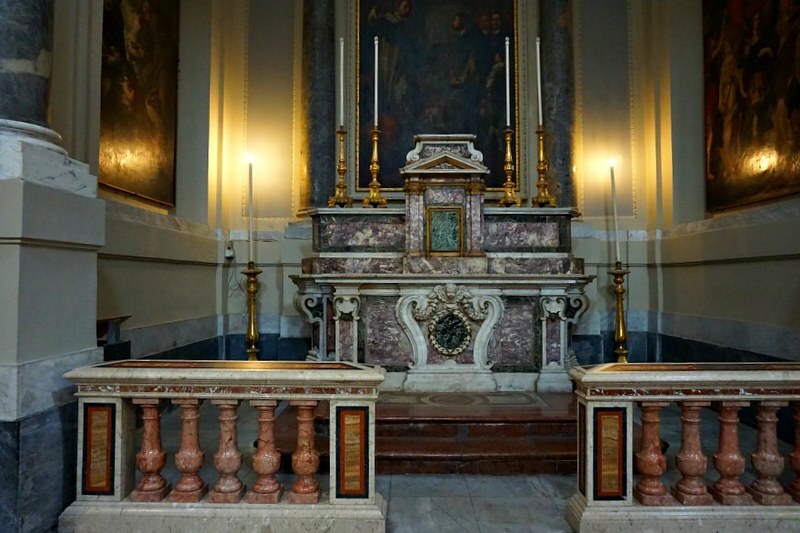 Behind the altar, Marco insisted was a room that was open to the public, and he urged us to take a look. 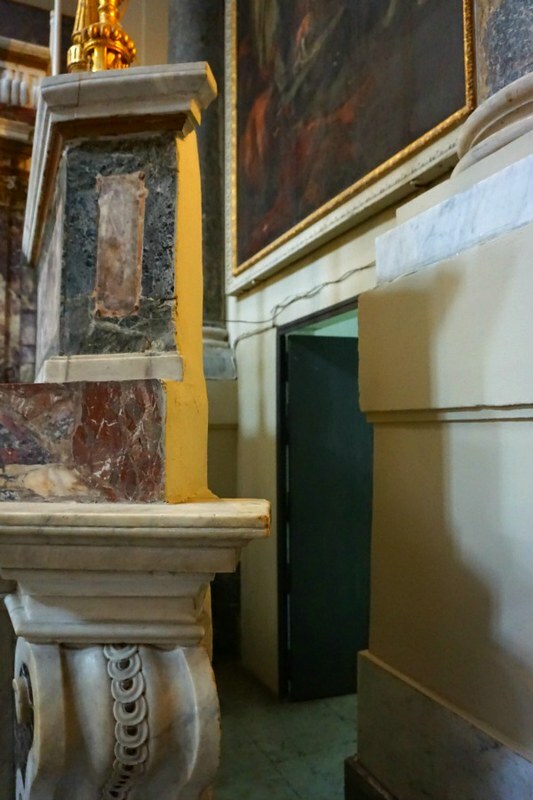 In my previous experiences, going inside one of these holy chambers seemed taboo. Despite our reluctance, we crept inside. 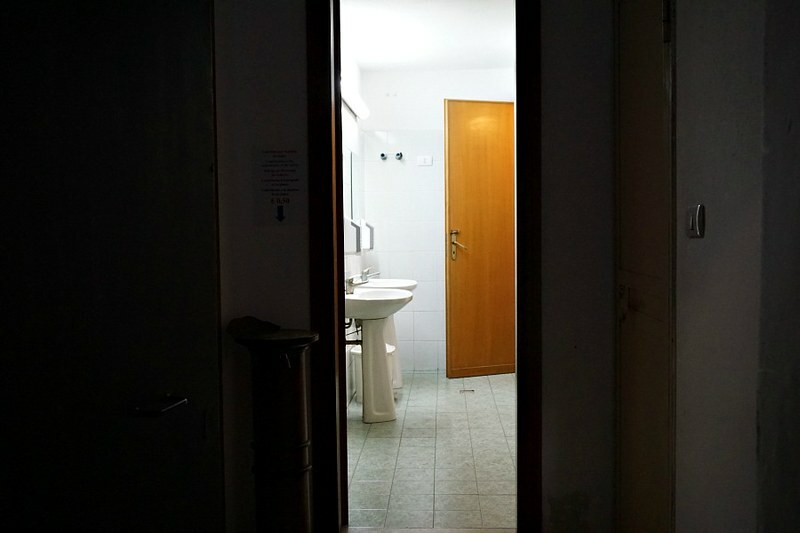 A public toilet – Really?!? Apparently, tourists who visit from the cruise ships are reluctant to follow the signs pointing to the toilet. This, I’ll admit, was a not to be missed stop on a tour of Palermo that doesn’t make it into the guide books (but should). 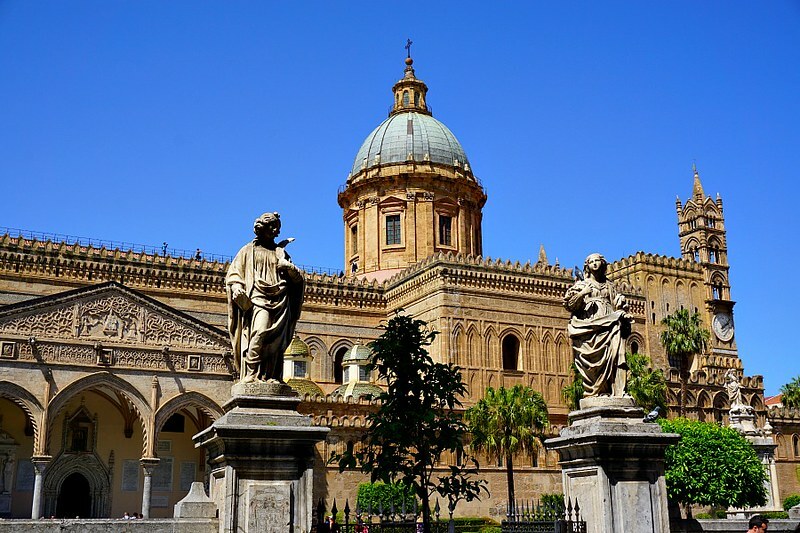 If you’re planning a trip to Palermo, contact Marco to find out more about this tour and to get insider tips that you shouldn’t miss during your stay. And head over to our resources page to find some ideas on saving money on flights , learning a foreign language on a budget, or picking up some gear that will help you travel with ease. 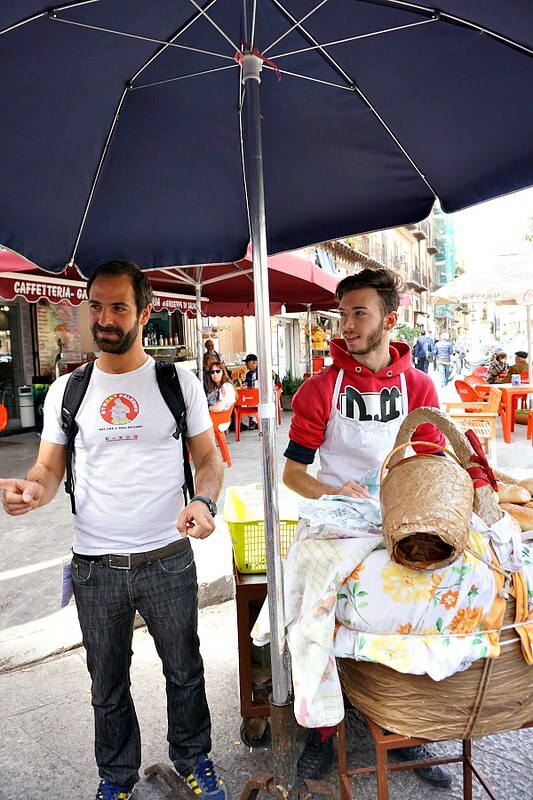 A special thank you to Marco, of Streat Palermo who hosted us on this Palermo Street Food Tour. Our opinions remain our own. 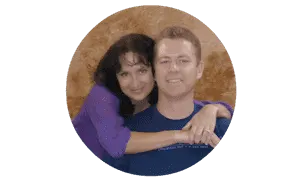 Note: Some of the links on this post are affiliate links – which means that if you click on them or make a purchase, we receive a small referral fee. If you do, thank you in advance. We appreciate your support. Sound like the perfect tour, I’m going to have to bookmark your page so I can access Marco’s details for when we visit! I absolutely adore places that have awesome street food! We’ve never been to Palermo, but I clearly would love what they offer for cuisine! What I’d do for that cheese and olive platter! Perfect, just in time for our trip to Sicily this May! I will keep Palermo’s StreEat tour in mind for our visit. All those dishes look so delicious and what looks like a new favorite for me is the spleen sandwich, YUM! Great photos or all the street food, can’t wait to dig in soon! Are you going to be traveling in other places in Italy? We’ll be touring around for a few months. Maybe our paths will cross? Oh man! Those photos look amazing. I think that is the most delectable canolli I’ve ever seen! I love doing food tours and experiencing local cuisines. I am usually skeptical about taking tours but this concept is brilliant. 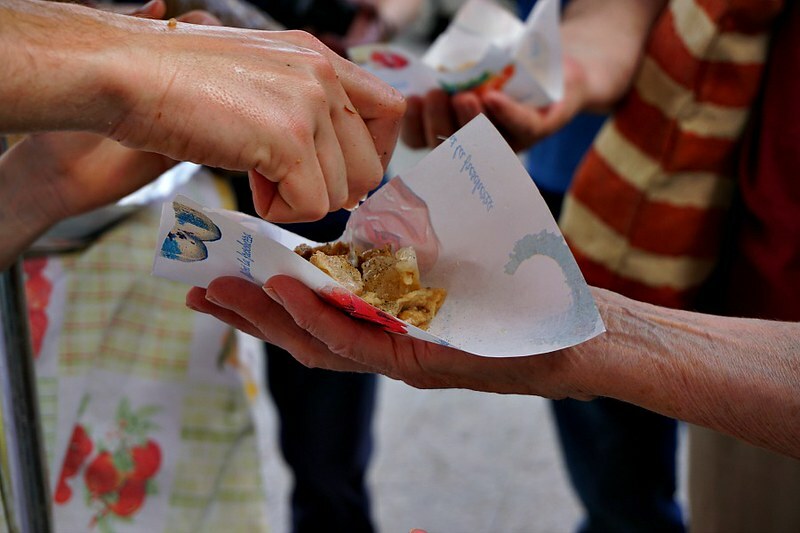 What a better way to learn about a city and its people by immersing yourself in local street food. Knowing about what people eat is a great illustration to their way of life. I love, love, love food and I love learning new techniques and ways of cooking so this will be perfect for me! I didn’t get to visit this city when I lived in Italy since I mostly stayed in the northern part of the country but I’m sure there will be a distinct difference in cooking styles and utilisation of ingredients! I am so excited for this. 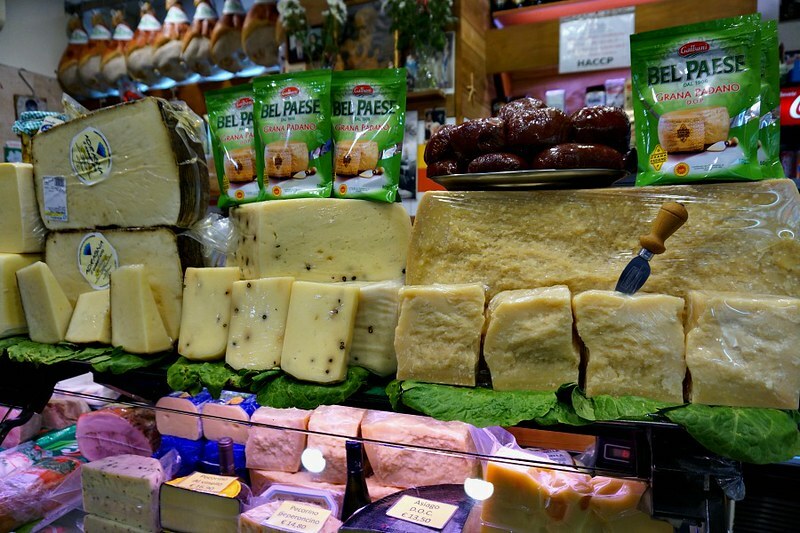 Now I definitely want to go to Palermo. Thank you, Sean and Jen! Enjoy the rest of Italy! This is an awesome write-up. 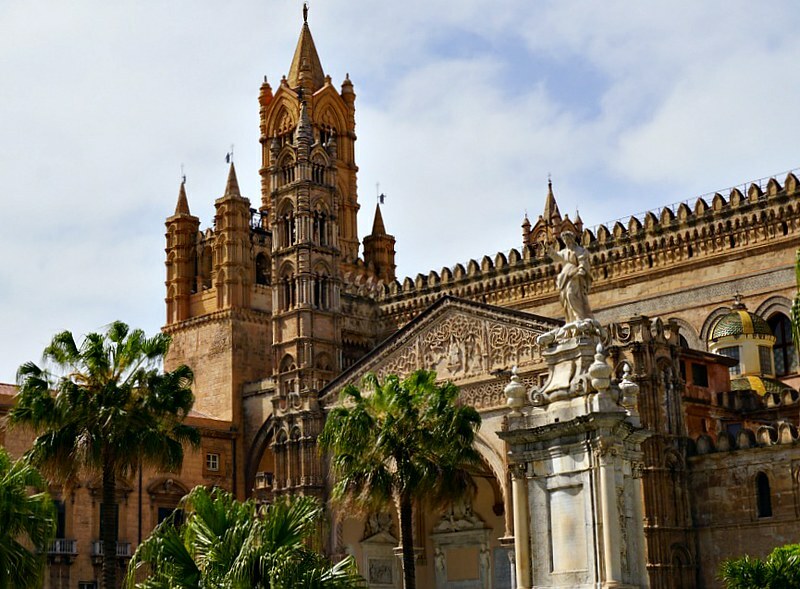 We are planning to visit Palermo next year and I am definitely bookmarking this. It looks like so much fun (and delicious!). Yeah! Palermo Street Food is the best ever!! I remember our experience with Giorgio (palermostreetfood.com) that Friday night! It was terrific!! I wish I could go back just now!! Where did you get that cannoli? Are they sold all over or is there a special place for the best ones? I canÂ´t remember the name of the cannoli shop that we visited, but yes no worries, they are sold in many shops. You wonÂ´t have trouble finding one!